● Use a phone after stopping your vehicle in a safe location. If you have to use a phone while driving, exercise extreme caution at all times so full attention may be given to vehicle operation. You can register up to 5 different Bluetooth® cellular phones to the in-vehicle phone module. NISSAN Voice Recognition system supports the phone commands, so dialing a phone number using your voice is possible. For more details, see “NISSAN Voice Recognition System” in this section. ● Set up the wireless connection between a cellular phone and the in-vehicle phone module before using the hands-free phone system. 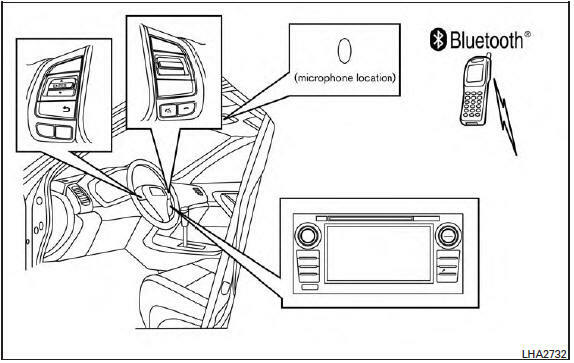 ● Some Bluetooth® enabled cellular phones may not be recognized by the in-vehicle phone module. Please visit www.nissanusa.com/bluetooth for a recommended phone list and connecting. ● You will not be able to use a hands-free phone under the following conditions: – Your vehicle is outside of the cellular service area. – Your vehicle is in an area where it is difficult to receive cellular signal; such as in a tunnel, in an underground parking garage, near a tall building or in a mountainous area. – Your cellular phone is locked to prevent it from being dialed. ● When the radio wave condition is not ideal or ambient sound is too loud, it may be difficult to hear the other person’s voice during a call. ● Immediately after the ignition switch is placed in the ON position, it may be impossible to receive a call for a short period of time. ● Do not place the cellular phone in an area surrounded by metal or far away from the in-vehicle phone module to prevent tone quality degradation and wireless connection disruption. ● While a cellular phone is connected through the Bluetooth® wireless connection, the battery power of the cellular phone may discharge quicker than usual. The Bluetooth® Hands-Free Phone System cannot charge cellular phones. ● If the hands-free phone system seems to be malfunctioning, see “Troubleshooting guide” in this section. You can also visit www.nissanusa.com/bluetooth for troubleshooting help. ● Some cellular phones or other devices may cause interference or a buzzing noise to come from the audio system speakers. Storing the device in a different location may reduce or eliminate the noise. ● Refer to the cellular phone owner’s manual regarding the telephone charges, cellular phone antenna and body, etc. ● The signal strength display on the monitor will not coincide with the signal strength display of some cellular phones.